When it comes to the CRYORIG H7 Quad Lumi, I think one could call it both a basic and extra CPU cooler, which is not a negative in either regard. In many ways, it follows in the design trends we have seen with previous CPU coolers. With solid material choices of copper, nickel-plating, and aluminum, the H7 Quad Lumi is not a whole lot of difference from other heatsinks. The extra heatpipe is also great to see as it truly helps with dissipating heat. Its small footprint and extra clearance makes compatibility with this cooler a nonissue. The RGB lighting also makes the CRYORIG H7 Quad Lumi both a bit basic and extra. Thankfully, we are not seeing rainbow lights all over the place, as the lights are in strategic locations to offer some pop without being blinding. Performance of the CRYORIG H7 Quad Lumi is also quite good, as it was capable of competing with larger footprint coolers with more fans attached. In addition, the delta of temperatures between the H7 Quad Lumi and stock cooler options is great to see. However, there are some notable detriments to point out with this colorful cooler. For one, the installation is not as refined as I would have liked. I wish they made both the backplate and the mounted arms more stable to prevent any wobbling about during installation. I also would like to see an RGB fan included here instead of a white LED fan for better synchronization. At press time, the CRYORIG H7 Quad Lumi can be found for around $55 USD, which is a pretty compelling price to performance ratio. If CRYORIG could make some improvements on the installation process and lighting, I think the H7 Quad Lumi would basically be what any extra millennial would want in their system. CRYORIG provided this product to APH Networks for the purpose of evaluation. While the installation process could be refined, the CRYORIG H7 Quad Lumi is a rainbow-spiced CPU cooler with great performance. 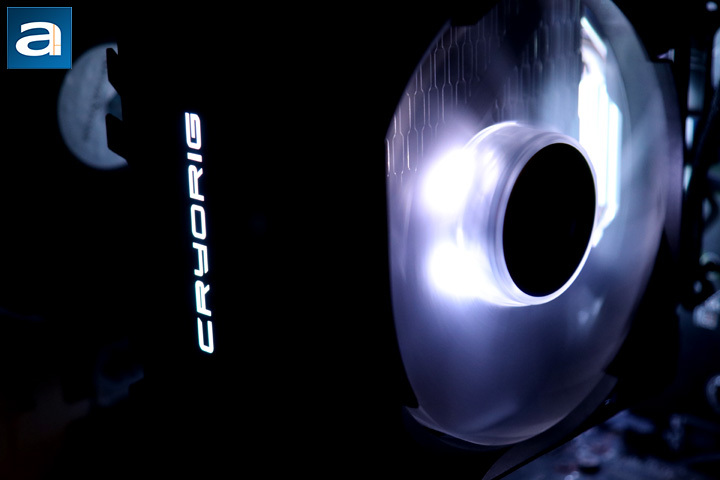 Do you have any comments or questions about the CRYORIG H7 Quad Lumi? Drop by our Forums. Registration is free, and it only takes a minute! posted 2 hours and 19 minutes ago, with 5 posts. posted 2 hours and 41 minutes ago, with 4 posts. posted 8 hours and 9 minutes ago, with 4 posts. posted 15 hours and 24 minutes ago, with 12 posts. posted 15 hours and 25 minutes ago, with 9 posts. posted 15 hours and 29 minutes ago, with 56 posts. posted 15 hours and 29 minutes ago, with 11 posts.